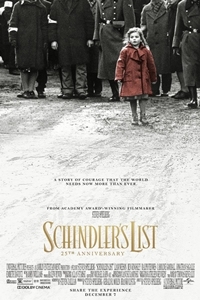 To commemorate the 25th anniversary release of Steven Spielberg's masterpiece Schindler's List, one of the most significant endeavors in the history of cinema, Universal Pictures will re-release the film with picture and sound digitally remastered-including in 4K, Dolby Cinema and Dolby Atmos-for a limited theatrical engagement on December 7, 2018, in theaters across the United States and Canada. Winner of seven Academy Awards®, including Best Picture and Best Director, this incredible true story follows the enigmatic Oskar Schindler (Liam Neeson), who saved the lives of more than 1,100 Jews during the Holocaust. It is the triumph of one man who made a difference and the drama of those who survived one of the darkest chapters in human history because of what he did. Meticulously restored from the original film negative in pristine high definition and supervised by Spielberg, Schindler's List is a powerful story whose lessons of courage and faith continue to inspire generations. The film also earned Oscars® for composer John Williams, screenwriter Steven Zaillian and director of photography Janusz Kaminiski, as well as art directors Allan Starski and Ewa Braun, editor Michael Kahn and producers Spielberg, Gerald R. Molen and Branko Lustig. Run Time: 3 hr. 15 min.